The Houston Dynamo kicked off the 2013 MLS Season at BBVA Compass Stadium on Saturday March 2nd with a 2-0 victory over D.C. United, with Ricardo Clark having a role in both goals. Over 20,000 soccer fans showed up in the eastend of Downtown Houston on a chilly, windy winter evening to get a first glimpse of how the team that lost the last two MLS Cup finals is shaping up for their next run at the MLS Cup final. The first half was a bit sluggish as both teams tried to shake off the last of the off-season rust. 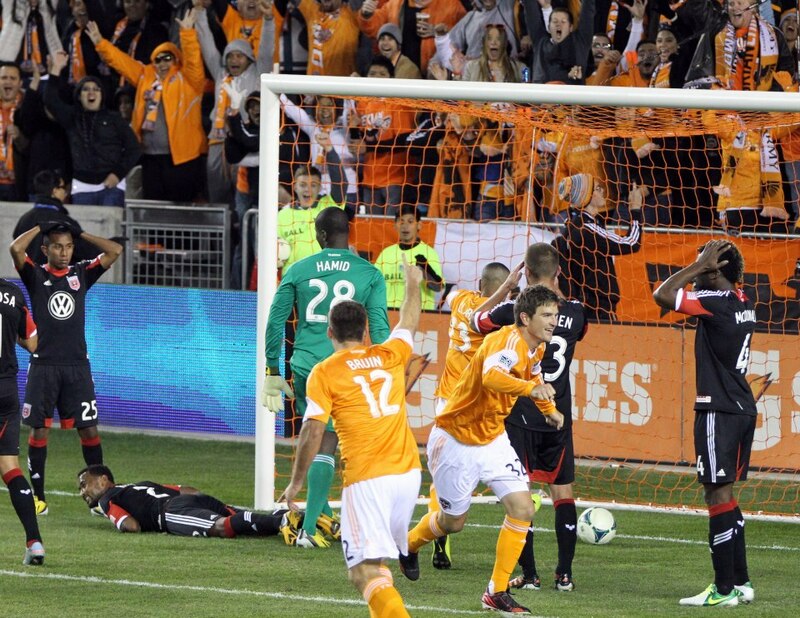 As the first half clock moved past the thirty minute mark, the Dynamo's offense was pressing the attack and a foul on Ricardo Clark set up a penalty kick for Brad Davis in the 40th minute; however, it was a poor clock and United keeper Bill Hamid guessed correctly, blocking the shot. This was Davis' third missed penalty kick in a row. Television viewers felt that the foul took place outside of the box and that it should not have been a penalty, but following the match, Ricardo Clark said that he felt it was in the box. The first goal of the match came in the 80th minute on a corner kick. The goal was initially credited to Ricardo Clark, but a review of the play showed it to be an own goal by United defender James Riley. Clark finally got his goal 8 minutes later, thanks to an assist by Warren Creavalle, who had just substituted in for Brad Davis. With Saturday's victory, the Dynamo continued their regular season dominance of D.C. United with an 8-0-1 record and 19 goals to United's 4 goals. In Saturday's match, United was not credited with a single shot on goal. The Dynamo's next match is at 7:00 p.m. on Tuesday March 5th when they host Santos Laguna in the first leg of the quarterfinals of the CONCACAF Champions League. The Dynamo do not have another league match until St. Patrick's Day when they travel to Frisco, Texas to face F.C. Dallas at noon central time. Dallas also opened the 2013 season at home on Saturday with a 1-0 victory over Colorado. Elsewhere in the Eastern Conference, Sporting Kansas City beatdown the Philadelphia Union, 3-1; the Vancouver Whitecaps pulled off a 1-0 victory over Toronto F.C. ; Columbus Crew rolled over reborn Chivas USA, 3-1; and the Montreal Impact picked up a 1-0 away win against the Seattle Sounders.